NODDY SAVES CHRISTMAS: Join Noddy on a festive adventure of music and merriment this Christmas! As snow-covered Toy Town excitedly prepares for Christmas, Noddy's mission is to finally meet Santa Claus. But Santa Claus is in big trouble! His magic clock that stops time all over the world is broken, which means he might not be able to deliver his presents. With his new friends Santa and Dasher the reindeer, Noddy goes on a whirlwind adv..
Join Noddy and his friends in Toyland, a place where toys come to life and adventures never cease! Enjoy six exciting adventures from Noddy and other Toyland favourites! This festive season, have fun with Noddy, Tessie Bear, Martha Monkey and all their friends as they explore themes of loyalty, teamwork and friendship in six exciting adventures in Toyland!Episodes on this DVD:Catch a Falling Star Forgive Me Not Just Be Yourself, Nod..
Join Noddy and friends in this special collection of Toyland tales. 6 enchanting episodes packed full of Goblin mayhem and adventure. Prepare yourself for Tricks, Treats, Mischief and Magic...!Noddy and the Missing Muffins Goblins Above The Great Goblin Switch Master Tubby Goblin Goblins Good Deed Day The Great Goblin Giveaway..
Join new 3D CGI animated Noddy and his friends in Toyland, a place where toys come to life and adventures never cease. In Noddy & The New Taxi, Sly and Gobbo, the two naughty goblins, set up a rival taxi business forcing Noddy off the road. However, Noddy`s toy town friends are soon disappointed with the service and want their familiar friendly and reliable Noddy back with his red and yellow taxi. Other Fun Filled Noddy Adventures On T..
Arrrr… Ahoy me hearties. All aboard for some mighty pirate adventures. Appearances from mermaid friends and pesky pirates… and of course Toyland favourites Skittles, Mr Plod, Tessie and many more! Noddy leaves no shell unturned in his search for adventure. X marks the spot for buried treasure… be sure not to miss out! Plus loads more fun packed Toy Town adventures with these great tales: High Tide, Noddy's Great Save, Yo Ho Noddy, Playt.. In Noddy and the treasure Map, Noddy and Bumpy Dog decide to go on an adventure. Sly and gobbo see an opportunity to cheat Noddy into buying a fake treasure map that leads Noddy and Bumpy Dog into the Dark Woods!Other fun-filled Noddy adventures on this DVD:The Goblins Stop Watch Mr Sparks and the Broken Clock Noddy on the Move The Flower Thief Mr Plod and the Jail Bird Shelf Help The Goblins and the Invisible Paint What Strange We..
join Noddy for Magical Adventures this Christmas! Enjoy the brand new adventure Noddy And The Magical Moondust! The Toy Town Fair is in town and everyone is excited except Big Ears. He's concerned because moondust has suddenly stopped falling from the sky - without which his magical finale to the fair cannot happen. Noddy and his exuberant friends set off on a mission to the moon to solve the mystery, meeting a new face, Marlon Moon, al.. The sun is shining bright on Toyland and everyone is on the mood for fun and excitement! Join Noddy and his friends for seven fun-filled adventures including a special trip to the seaside and a ride in Noddy's amazing speedboat!Noddy Gets Lost Noddy & The Skittles Noddy Helps Out Noddy The Artist Noddy & The Funny Pictures Master Tubby's Name Game plus Noddy & The Island Adventure..
Noddy and Master Tubby Bear want to find the pot of gold at the foot of the Toy Town rainbow - even though they have to fly into the Dark Wood! But this is a magic rainbow and it has plenty of surprises for them! Plus loads more fun packed Toy Town adventures with these great tales:Noddy And The Lost Tool The Tell-Tale Bell Bumpy Dog's Visit Up, Up And Away Above It All..
Join Noddy and friends for a barn-sized amount of animal fun! Noddy has 6 exciting adventure with all your Toyland favourites plus loads of different animal such as chickens, the clockwork Mouse, bugs, bumpy Dog and a host of farmyard animals.Noddy and the Big Chicken Roundup Clockwork Mouse's Wish Mr Plod's Little Problem Driving Miss Pink Cat Noddy And The Magic Sound Of Cups Noddy's Car Loses It's voice..
Join Noddy and his friends in Toyland, a place where toys come to life and adventures never cease. In Catch A Falling Star, Noddy, Tessie Bear, and Martha Monkey go on an overnight camping trip and see a falling star land in the woods nearby. The trio must find a way to return the frightened star back to the night sky before it becomes trapped on the ground forever. When Sly and Gobbo kidnap the star, it takes some clever teamwork to br..
Join Noddy and friends in 6 enchanting episodes of magical, mystical fun! 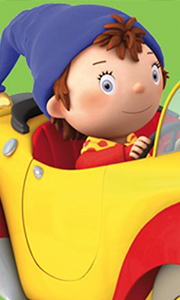 Join Noddy in 6 magical adventures in Toyland! Come and see the wonders of the magic paintbrush, and what happens when Mr Plod uses ‘Go Faster’ dust. We have goblins, fairies and lots of mayhem in Toyland as Noddy and friends discover what a bit of magic can do. Plus loads more fun packed Toy Town adventures with these great tales: Noddy and the Magic Paintbrush, ..